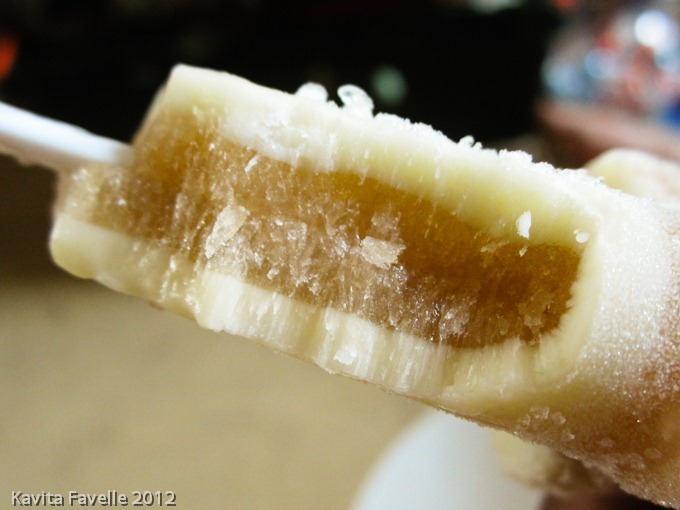 With thoughts of summer holidays in mind, I set the theme for August’s BSFIC as ice lollies. Summer made you lethargic, and we had less entries than usual, but that simply gave a better a chance to win the wonderful prize from Lakeland, for those who made the effort! Here are all the lollies! So eager was I to share my genius idea with you that I posted my first BSFIC post right at the beginning of the month! My Pickleback Ice Lollies (bourbon + pickled gherkin brine) were both lauded as fabulous and scorned as disgusting, but hey, they definitely got a strong reaction! Let me know what you think but if you’re at all curious, I’d suggest giving these a go yourself. I also made versions with just the pickled gherkin brine, and loved these too! 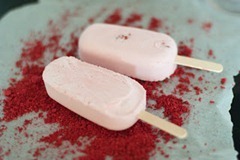 Hannah from Corner Cottage Bakery created these very indulgent adult-only Peach Bellini Lollies. The process is two fold: first Hannah pureed and combined peaches, lemon juice, vodka and sugar which she froze in lolly moulds, and then she served the lollies in glasses of champagne. Flat peaches are still in the shops – I’ve been gorging myself on them for many weeks – so you’ve plenty of time to make your own! From adults only to a recreation of a favourite childhood memory: Laura from How to Cook Good Food made a Banana Shake Pop that couldn’t be more simple – her instructions call for you to "go to your local corner shop, sweet shop or post office and buy yourself a bottle of banana milkshake. Pour it into some lolly moulds and freeze." Nostalgia rules! Back to me again for my second entry this month. I made Coke Float Ice Lollies in honour of that much-loved magic that is the coke float. The outer shell is vanilla custard and the inside is frozen Coca Cola. They worked well enough, but am keen to try them again haven taken on board the suggestion to reduce the Coca Cola to a more concentrated syrup first. Since the fizz doesn’t freeze anyway, this would be a great way to achieve a stronger coke flavour. 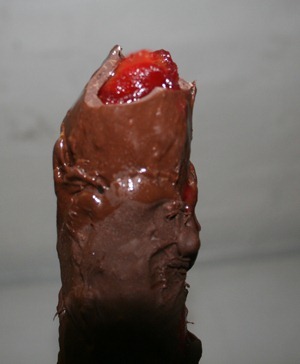 Something quite unusual from Gill, the author of Tales of Pigling Bland who posted about her BFG Lollies, so named for the black forest gateau flavours of chocolate and cherry. Gill combined chocolate cake, cherryade and a few ripe cherries, though she adds a postscript wondering whether the cherry wine she came across recently might have been even better. I really like the multi-level aspect of these! BB from London Busy Body wanted to celebrate the sunshine with "something that tasted like I was on a tropical island", featuring fruit and not too sweet. 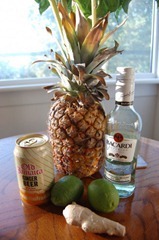 She combined fresh pineapple, ginger, lime zest and juice with ginger beer and rum to make Pine-ginger Rum Pops. All the ingredients except the ginger beer were blitzed together to make a thick liquid, and the ginger beer mixed in with a spoon before pouring into the moulds. 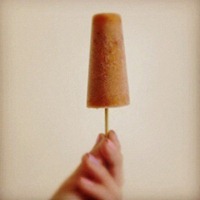 Jennie from Things I Eat worried that her Summer Lollies wouldn’t count as proper lollies as they’re not a frozen liquid. 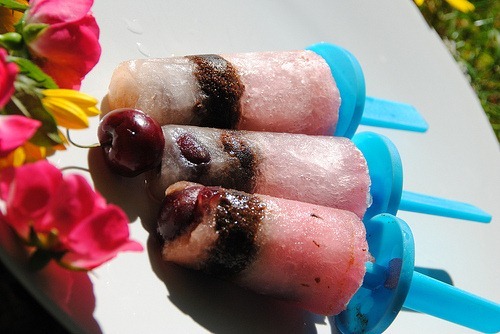 But my definition is much broader, including frozen fruit puree, custards or really anything liquid enough to pour into the moulds and enjoy frozen on a stick! She made an Italian meringue into which she folded sieved raspberries and double cream. This was frozen (around a core of whole fresh raspberries) and then dipped into crushed freeze-dried raspberries for a fantastic finish. Monica from Smarter Fitter has a bit of a thing for frozen things, so it’s no surprise we made a fair few when Pete and I visited one weekend during August. In fact we spent the whole weekend cooking and eating! 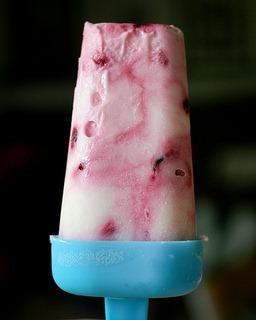 After a blackberry picking walk, I made some simple blackberry jam and Monica combined some of it with a little alcohol before swirling it into thick, tangy Greek yoghurt to make these refreshing Easy Yoghurt & Jam Popsicles. Squeezing in just before the midnight deadline, Procrastibaking blamed man-flu for his tardiness, though he’d been experimenting on his entry for some weeks. Having made my coke float ice lollies above, I’d lamented on twitter about the way the fizz disappears on freezing the coke. 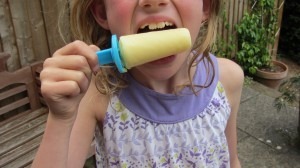 So this cute young scientist determined that he’d find a way to make Fizzy Ice Lollies. After trying many methods (including making a micelle, yes I’ve learned a new word!) he finally struck upon the idea of putting the fizz into the chocolate shell surrounding the frozen liquid. Very clever! Mardi from Eat Live Travel Write sent this one in just past the deadline, so I’m including it in the roundup but not the competition. After making delicious peach melbas for a Dorie Greenspan challenge, Mardi wondered what to do with the two portions that had melted in the heat. After popping them into the fridge to think about, she suddenly thought to freeze them, and made some delicious Peach Melba Ice Lollies! Even with only a few entries, it was really hard to pick a winner, but in the end I was seduced by the originality of the idea, the step-by-step photographs and the fact I’m desperate to try this lolly for myself. 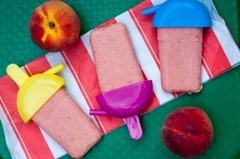 The Zoku Quick Pop Maker and Zoku Character Kit are going to… Jennie from Things I Eat. Please can you send me your postal address, and I’ll pass them on to Lakeland to have your prize sent on to you! Congratulations! I’d also like to send a consolation prize to Procrastibaking, who came a very close second place. Please send me your address too. Thanks again for entering and thank you to everyone for reading. If you like what you see, do pop over and leave your comments on the individual blogs. I’ll be posting a new theme for September’s BSFIC in a couple of days. I hope it will inspire you to have a go too! 23 Comments to "Bloggers Scream For Ice Cream: August Roundup"
I think I’d enjoy all of them but the combination of meringue and raspberries just has me salivating! I couldn’t find anything to make lollies in but I don’t think I’d have come up with anything this good! I’d need to try those pickleback ones, but I know I’d love the coke floats and banana milkshakes ones. I’m off to the pound shop to see if I can get a lolly making kit! 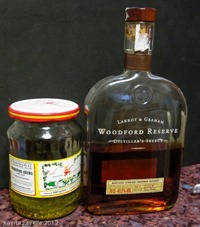 Let me know what you think of the picklebacks! Well done to Jennie. Your entry does look lovely :-)! I think you chose a worthy winner there from Jennie. Love the idea of dipping the lollies into freeze dried raspberries. For me, however the winning choice would have been your pickleback lollies. I am mad about gherkins and know this would be mind kinda lolly…….Very good stuff! Thanks Laura, definitely get more positive than negative responses to that one, though still some eeeew expressions coming through! Am pretty sure the key has to be in getting the right kind of picklejuice/gherkins…? Yes, you definitely want a juice you like, the one I preferred of the three I’ve used has a perfect balance of sweet and sharp. The Amsterdam ones were superb, as were the ones made using Lidl 65p gherkins. The Aldi gherkin brine was fine once I’d added an extra teaspoon of sugar to balance the flavours better. What a fabulous roundup! And with the temperatures about to soar this weekend in Toronto, I might have to test a few out! Wonderful. You can find many other cooling treats in the roundups for previous months too! Thanks for a great round up as always Kavey. I’ve sent you this link on twitter, but other might be interested to see these pretty lollies which were in my feed directly before this round up. Procrastibaking gets my thumbs up for the nerd factor. You’d get on great! He’s coming to visit next week so we can be procrastinerdy together! There are some fine treats there. I’m very impressed by the idea of adult lollies and I’m still slightly bemused by the pickleback. Aah you’ll have to give them a try, both adult lollies in general and perhaps the picklebacks, if you fancy! 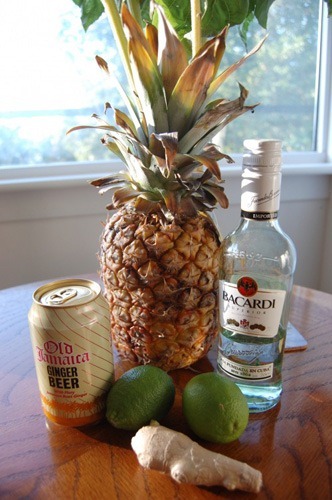 What about the Pine-Ginger Rum pops? The link to my post is below. Aah sorry, don’t have an email for that one, did you send one? Will add it in. Done… have added it in.